The method of changing the refill for the Cigar and the 8mm Euro style pens is identical. Only the Cigar is shown here. 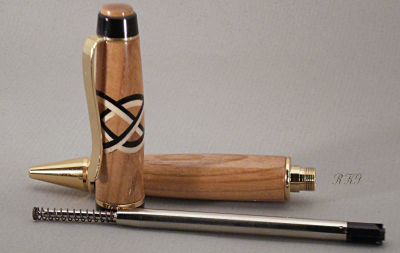 Photo of the cigar style pen as received from us. When the ink runs out the "Parker" style refill will need replacing. To access the refill unscrew the two halves of the pen as shown in the next photo. Photo shows the two halves of the pen taken apart. The "Parker" style refill can easily be seen and removed. The refill has been removed. Remove the spring install it on the new refill and reassemble the pen in the reverse order. 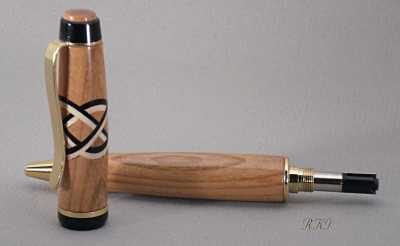 Take a look at the wood grain orientation between the top and bottom halves and realign them when putting the pen back together.